The SWR Bridge R&S®ZRB2 is used to measure the magnitude and phase of the reflection coefficient, e.g. of filters, amplifiers, mixers or antennas. The output signal a from the generator is fed via the SWR Bridge to the device under test. 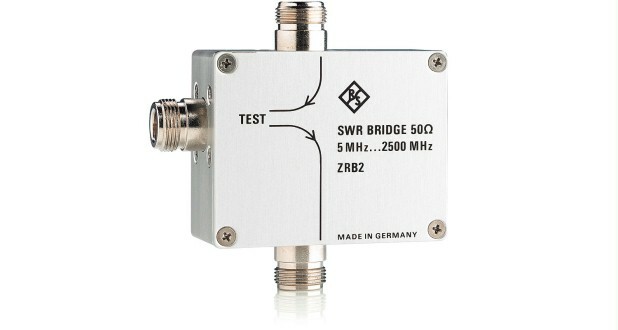 The SWR Bridge R&S®ZRB2 is used to measure the magnitude and phase of the reflection coefficient, e.g. of filters, amplifiers, mixers or antennas. The output signal a from the generator is fed via the SWR Bridge to the device under test. Part of the signal is reflected via the SWR Bridge to the indicator, the amount depending on the reflection coefficient r of the device under test. This part b of the signal is a measure of the complex reflection coefficient r of the device under test. Intelligent indicators convert the measured reflection coefficient into other parameters, e.g. the impedance or admittance of the device under test. In this case, display is possible as magnitude and phase as well as real and imaginary quantities.